Let’s buy the UK! How much is nature worth? This question tasked the BBC’s stats guru, Anthony Reuben. He was picking up on this infographic put out by the Office for National Statistics (ONS) for World Environment Day. I’m inclined to agree that it is meaningless from an eco-environmental or enviro-economical or whatever technical point of view. And ONS does acknowledge some of the foundation for this. But there is another way in that it is meaningless? Just what does £1.6 trillion – that’s £1,600,000,000,000 – mean? To have meaning, we usually need something to relate to us on a human scale. What is the most expensive thing you’ll buy? Probably a property. ONS – in March 2015 – found that the average UK house price was £273,000. So, we could buy close to six billion properties with £1.6 trillion – not much less than one for each person on the planet! Or we could take the view that as a UK asset, we could look at what it means for each and every one of us. A rough estimate of the UK’s population is 65 million. 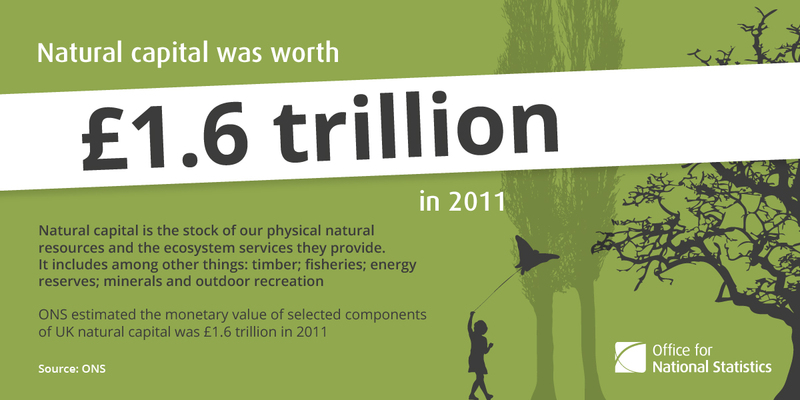 From this, the UK’s natural capital is worth not far off £25,000 for each person in the UK. Now that seems more meaningful. If every person – adults and children – chipped in £25,000, then we could buy the UK! Alternatively, we can ask ourselves as individuals – are the UK’s natural assets worth £25,000 to you? To me, no. It would be worth a lot, lot more given how much I might access. And, if anything, it shows how making a big number meaningful actually shows up just how ‘meaningless’ it can be. Previous Previous post: Friday quiz time – which island is which?